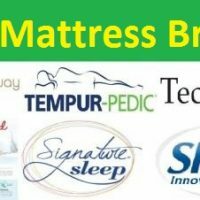 Tired from a bad night’s sleep? Looking for a normal, non-drug treatment for insomnia, anxiety, stress, ADHD, or autism? The cure can come in the form of a weighted blanket and you need to add this essential product to your household items. Originally made for children with autism, weighted blankets have come into the forefront for their supposed calming and sleep-inducing effects. Weighted blankets help you lighten up as the additional pressure makes you exactly feel that you are being held or hugged by somebody when you sleep. The way the blanket molds to your body is a kind of deep pressure therapy (DPT) – compact squeezing, cuddling, embracing, or swaddling that soothes the nervous system. Safe for children and adults alike, weighted blankets help with many sleep and sensory issues, leaving you feeling more relaxed and ready to seize the day. Weighted blankets help you sleep better, if you are puzzled what to purchase, check this rundown of 15 best product recommendations to make a decent purchase. You also have an alternative for comfortable sleep with the best electric heated blankets. Key Features Of High-Quality Weighted Blankets: What Must You Look For? What Are The Notable Aspects You Must Inspect In Detail When You Buy A Weighted Blanket? As the name signifies, the weighted blankets are much weightier than standard blankets. The pressure they offer helps relieve symptoms of problems like insomnia, chronic pain, anxiety, sensory processing disorder, ADHD, autism. Originally intended for kids and adults who suffer from autism, sensory processing disorder, ADHD, weighted blankets have extended their reach and help people relax, feel good, and sleep healthier. Research shows a lessening in anxiety, strain, and insomnia with its use. Occupational therapists suggest weighted blankets and vests for long to soothe patients with various developmental and medical conditions and to calm kids with sensory processing disorders. Weighted blankets work by offering deep pressure to stimulate the serotonin release, a hormone that regulates mood. This causes less anxiety, a feeling of tranquility, and enables falling asleep. It’s similar to the fine feeling obtained while hugging a loved one or the soothing effects of cuddling a newborn. Weighted blankets can vary in the general construction design and how they are weighted. Following are its various types. Box-Construction: Some weighted blankets are constructed alike a down-filled comforter, the design of every ‘box’ or compartment consists of weighted substances, like poly-fill, glass beads, and poly pellets to treat a diversity of ailments, including insomnia, post-traumatic stress disorder, OCD, ADHD, circumstantial stress and extended anxiety. Some DIY blankets are filled with products like rice or beans which can degrade eventually. Channel-Construction: These weighted blankets are made of a channel compartment design that encloses the material. The channel compartment construction permits the weighted material to be consistently distributed all through the blanket so that, if draped over your body, the weight is distributed regularly. The channels permit less movement of the material and therefore the sensory stimulation is softer and more soothing. It’s suited for persons who are tactile defensive; responsive to new and altering sensory impressions. DIY Blankets: Just like a down comforter can be put in a fabric shell, some DIY weighted blankets have a washable external layer customized by fabric texture, shade, or pattern. Researchers proclaim that pressure on the body in definite areas triggers the chemical release in your brain, like serotonin, that triggers a decline in stress and anxiety by improving mood. Fully-Sewn Blankets: Some weighted blankets are built fully sewn together, making it washable but the cover isn’t removable. The interior material contents are most prominently considered. These blankets have the fullness to release melatonin, a hormone that encourages sleep and the sleep cycle. The hormone is associated with the serotonin production, so the pressure that activates the chemical will also increase melatonin production. While weighted blankets aren’t complex, consider a few things while choosing one. Size: Weighted blankets are available in an assortment of sizes, twin, full, and queen, it won’t envelop your bed as a regular blanket. Weighted blankets usually cover the bed’s top, and never hang down at the sides. Or else, the weight pulls the blanket over the bed edge if you toss and turn. Small weighted blankets wrap around your shoulders, lap blankets and weighted vests help uneasy kids sit still. Fabric: Most custom weighted blankets allow you to select the preferred fabric. If you’re looking for a heavy blanket for insomnia, pick a soft fleece/flannel fabric. Kids with sensory concerns can prefer fabrics that are satin, fleece, chenille, somewhat rough, rugged, or nubby. Weight: Fills used in weighted blankets are rice, sand, beans, plastic pellets, and glass beads. It’s usually easier to clean blankets packed with plastic pellets. Quilt or Baffle: Unless your blanket has quilted baffles or sewn boxes throughout the entire thickness, the pellets or sand might shift unevenly. Almost every weighted blanket is baffled to avert this and maintain the heaviness in place. Outer Cover: Weighted blankets are difficult to clean and dry, duvet covers can protect it from sweat, fluids, and grime. When the duvet cover has to be cleaned, simply remove and wash.
Poly-Fill: Some weighted blankets have poly-fill with the weighted material to render a customary blanket look. This is important for kids who are self-conscious about their weighted blanket and crave a bed cover that doesn’t attract attention. Read our complete guide about the best throws and blankets for winter. 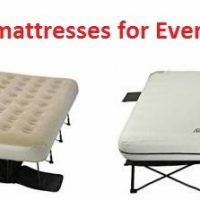 As you are prepared to purchase a new weighted blanket, be sure you decide on nothing but the finest, so here are some imperative features that you should consider. Blankets come in an assortment of colors, weights, and materials. Weighted blankets classically weigh between 2-24 pounds. Finding out what weight to purchase can be complicated, and depends on personal savor. Most companies permit returns somewhere from 7-30 days after purchase, so if the product doesn’t feel right, you normally can swap it for a new weight or size. You’ll find weighted blankets from 5-25 pounds. Generally, the heavier the blanket, the bigger it will be. For a kid or a teen, select a blanket that’s 10% of body weight plus an additional weight to make room as they grow. So, for a 40-pound kid, you’ll purchase a 6-pound blanket. Most makers remove the guesswork and present practical guides on websites for which blanket to prefer based on your mass. If you desire a blanket with lesser height or warmth, pick a blanket without poly-fill. If you’re purchasing a pre-made blanket proposed for adults, get something made of weighty cotton or flannel. Colors and patterns depend on preference. Pre-made blankets are often gray, blue, or a different neutral tone. Custom-made blanket makers classically offer a very extensive variety of child-appealing patterns and shades with adult-pleasing options. 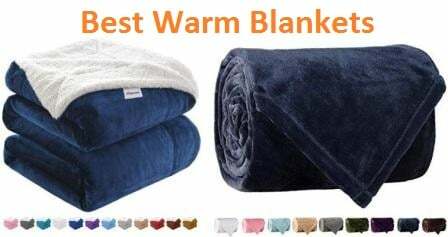 To settle on comfort, think about how often the blanket is used, it must provide fullness, warmth, back/body support, stress/pain relief, with sufficient breathability. Experts advocate buying the blanket to which your body can be habituated to sleep, so an uncomfortable product causes deprived sleep. Seek high-quality ergonomic support, it must offer evenness and finest spinal support to make sure there’s no pain. If you seek relief from anxiety, find a blanket that has more pounds above the customary instructions. Weighted blankets stimulate the serotonin production, owing to the power of pressure. The sensation of a weighted blanket replicates the calming feeling from a warm hug or touch. Serotonin encourages a feeling of contentment, repose, and well-being. Interestingly, serotonin is a forerunner to melatonin that helps us relax and fall asleep. To enhance durability, safeguard your weighted blanket and keep it fresh with a matching cover. Some blankets can be washer-and-dryer safe. The blanket maker specifies washing guidelines. Think of purchasing a duvet cover to shield the blanket. That way, you merely rinse the cover, not the blanket itself. Put it on your body for 15 minutes, note pressure points or restlessness. Showrooms exist; it is worth checking out special options. When you invest into a new blanket, be sure you’re safe for long and the piece stays in perfect condition. It’s essential to confirm the warranty. The premium models come with several years of warranties. Focus on useful certifications. Check if the blanket requires regular upkeep since you will be using it in a regular basis. Ensure the material meets the regulations for the health hazards. The item mustn’t have banned materials that are toxic to health. Patients of restless leg syndrome frequently come across relief with a tiny weighted blanket enveloping their legs during sleep. If you are want relief from anxiety or sleeplessness, you might spend the night beneath a blanket sized to accommodate your bed. If you hope for superior focus or tranquility during the day, a tiny blanket that engulfs your shoulders might be good. Many kids with sensory issues or ADHD find it simpler to concentrate and stay still with a tiny weighted blanket across the lap. If the blanket is for someone aged or with inadequate power, buy a lighter blanket, not the complete 10% of body weight. Weighted blankets are useful for a broad variety of conditions, like anxiety, sleeplessness, PTSD, sensory disorders, autism, restless leg syndrome, and chronic medical conditions like fibromyalgia. Get phenomenal comfort with YnM Weighted Blanket (25 lbs for 240 lbs individual, 60”x80”, Queen Size)! 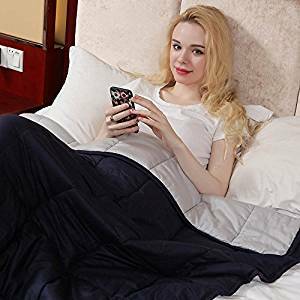 Queen-size YnM Weighted Blanket (25lbs for 240lbs person) offers great sleep therapy for persons with anxiety, autism, ADHD, insomnia or stress. Dark grey-shaded inner weighted layer YnM provides the maximum sizes, weights and hues of the weighted blankets, like classic COTTON, luxury BAMBOO, sensory MINKY and different duvet covers. 25lbs queen-size heavy blanket is 60”x80” and is of organic cotton & filled with glass beads. Choose the blanket weight at 10% of the body weight plus 1. Don’t choose oversized blanket. With new sewing design, organic cotton and fewer poly-fill & additional glass beads, it’s perfect for body temperature control. It’s cozy for all seasons. YnM sews it in mid-size compartments for consistent distribution and ideal adaptation to the body. The compartments are consistently filled with hypo-allergenic, non-hazardous, fragrance-free premium glass beads that are silent as you turn over and it’s not uneven like plastic pellets weighted blanket. YnM gives the soundest sleep with maximum comfort. And the comforting weight on legs eases all RLS symptoms and drifts you to a sound sleep. Get a feeling of peace and comfort as you lay it on the body. Optional fabric and covers let you customize the blanket, you can choose color or pattern, and the fabric and feel. YnM is customizable to any precise size and weight for comfort. YnM weighted blanket is for everyone needing better sleep. The weighted inner layer is machine-cleanable on a gentle setting. For durability, dry-clean is suggested. A superior option is to buy a duvet cover that comes off for easy cleaning. YnM is a top-grade, therapeutic weighted blanket that encourages deep touch stimulation to softly dispense deep pressure across the body. It relaxes the nervous system by simulating the sentiment of being held or embraced. This raises serotonin and melatonin levels and lessens cortisol levels to improve your mood and promote calming sleep concurrently. YnM makes you fall asleep faster and sleep better. It’s a great sleep therapy for individuals with anxiety, autism, ADHD, insomnia or tension. It solves all sleeping problems. 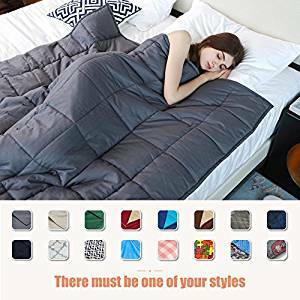 Find solace with ZonLi Breathable Weighted Blanket for Adults Women, Men, Youths | Great for Insomnia, Autism, ADHD, Stress and Anxiety Relief! 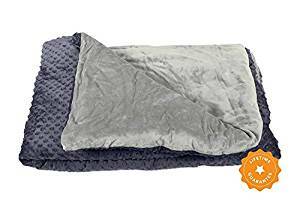 ZonLi breathable weighted blanket for adults, women, men, young persons, is great for sleeplessness, autism, ADHD, nervous tension and anxiety relief all night long. Grey 25lbs ZonLi is a weighted inner blanket with cotton duvet cover to fit king-sized bed measuring 80”x87”. ZonLi weighted inner blanket is built from 100% premium cotton and sewn into minute boxes/squares. Each square is filled with small non-hazardous pellets to dispense weight consistently across the entire body for a better comfort. The duvet cover is 100% cotton, more breathable to avert overheating and is appropriate for summer. 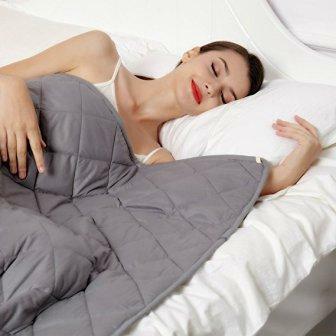 ZonLi weighted blanket is used in varied ways, as a full body cover in bed or while sitting, place it on the lap, shoulders, around the neck, on back, or legs. You will notice a huge progress in sleep. If you usually wake numerous times a night, you will actually sleep through the night after using ZonLi. The sensation of comfort and relaxation is instant. ZonLi is very high-quality; even most hesitant people are convinced by the comfort factor instantly. ZonLi blankets are machine-washable on a gentle setting; you might dry clean or hand-wash to get it clean. The weighted blanket must be 7%-13% of the body weight to soothe the nervous system and to help release stress, anxiety and stay asleep. 10% of body weight is suggested. ZonLi helps in fibromyalgia, arthritis, and restless leg syndrome, so there’s no more waking up in the middle of the night in soreness, your pets can feel relaxed when anxious. Find a perfect sleep gadget with Premium Weighted Blanket, Perfect Size and Weight (12lb) For Adults and Children. Deluxe CALMFORTER(tm) Blanket Relieves Anxiety, Stress, Agitation, Insomnia! Initiate your journey to more soothing sleep, less anxiety and stress by investing in a CALMFORTER weighted blanket. The profit of pressure therapy is well-documented and you will be totally delighted with the class, ease, and performance of CALMFORTER with a 100% consumer satisfaction guarantee. CALMFORTER has industry-exclusive EVENFLOW™ technology for ultimate smoothness and relaxation. Enjoy calm, even pressure evocative of a complete body hug because of the ingenious CloudSoft Polyfill™ and Stardust Microbead™ weighting system. Available in 5 other color choices, this 12lb CALMFORTER blanket is Moonshadow Gray/Chinchilla Gray meant for adults and kids. CALMFORTER has ultra-luxurious Minky fabric cover. Outer cover is downy as silk on one side whereas the opposite side has unique SensaDot™ textured pattern for fingers/hands that fidget. Unlike most weighted blankets that have obvious bumpy, square pocket stitching, CALMFORTER has wholly soft, non-therapeutic appearance since the whole weighting scheme is totally concealed inside the cover. There’s liberal 60″x80″ dimension. It’s perfect for grown-ups who desire a full-size blanket and good for kids; just leave any superfluous weight bunched up at the bed’s end. Shield your investment with a blanket that growing kids won’t outgrow. Want something lighter? Use half of it for a 6lb. weight and 3/4th for a 9lb. weight. Need more? Simply double up the blanket for twofold the overall pressure. CALMFORTER delivers versatility and ease. 2-part construction allows for easy washing and long life. The outer cover effortlessly zips separately for speedy, trouble-free washing and fast drying. Don’t have to wash the full blanket as with outdated ones that take forever to dry up and worsen speedily as the weights are constantly washed. You can sleep so much sounder without your usual tossing and turning. The cover is very supple and comforting, and with the mass of the blanket it’s like resting wrapped in a hug. CALMFORTER isn’t small like blankets with outmoded, obsolete weight calculation formula. It isn’t constructed as a 1-part blanket with lump-like cube pockets and weights that clatter freely. That’s why it’s not hard to wash and dry and doesn’t wear out rapidly and doesn’t have to be discarded prematurely. It’s a perfect gadget if you have night terrors, talk in your sleep and suffer from sleeplessness or twitch legs. If you suffer from anxiety and depression, CALMFORTER is the answer. It is perfect for a queen bed in winter. CALMFORTER blanket has one side purposely for individuals that are sensory-dependent, and the other side without the bumps is great for someone who doesn’t require the additional sensory accommodation. 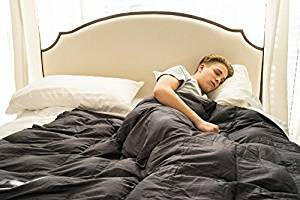 Go off to sleep with Harkla 25lb Weighted Blanket for Adults! Harkla 25lb weighted blanket for adults helps with sleep, nervousness, autism, or sensory processing disorder. Get the sense of serenity you’ve been looking for, the duvet-style profound blankets will present you the calm & comfortable feel of pressure you require, it’s best for patients who weigh 200+lbs. 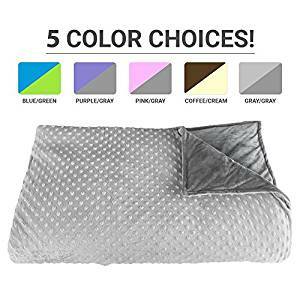 Slate Grey & Light Grey-colored 25-pound hypoallergenic Harkla has a 2-piece style that permits you to effortlessly wash the blanket cover at home, there are 3 colors to choose, Blue & Green, Purple & Lavender, Grey & Slate Gray. Plush Minky fleece-like premium removable duvet cover is enormously spongy. It stays soft through washing. Tiny glass beads & fluffy cotton gives an evenly-distributed, weighted, genuine blanket feel. The weight from therapy weighted Harkla helps you feel tranquil, making the slumbering much easier. The soft minky fabric stays squashy with washing, the fluffy cotton filler produces the most comfortable feel. With the 2-piece duvet like removable cover, it is trouble-free to take out the top layer to wash/dry at home. The blanket is in two pieces, as a duvet kit. Just take the cover off for a swift cleaning. The inside weighted section can be machine rinsed at home. Get a lifetime guarantee! Unless you are 100% pleased, Harkla can respond to any questions or apprehensions you have. It’s perfect for people with anxiety, sleeplessness, restless leg syndrome, or other issues affecting sleep. No need to take supplements. The soft Minky fabric with additional dots on top has sensory input to help with SPD, ADD, ADHD. Harkla helps with meltdowns, trauma healing, and dementia; totally owing to the calming neurotransmitters like serotonin and melatonin released by its deep touch pressure. Reduce your stress with rocabi Summer Breathable Weighted Blanket & Cotton Cover! Rocabi is a business committed to exceptional quality and service. Created to help those with anxiety and insomnia, the mission is to help the world sleep nicely. 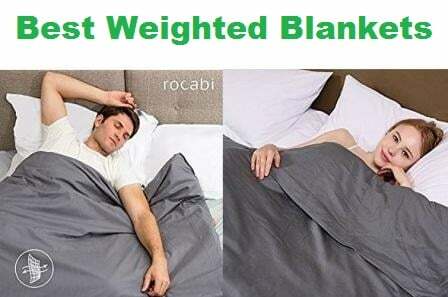 rocabi summer-breathable weighted blanket & cotton cover is to reduce strain & anxiety with a classic gravity blanket to perk up the quality of rest with this sleep aid. 25lbs Cotton rocabi measuring 60×80 is made of plush polyester, micro-fiber, Minky fabric; it’s engineered to be 7-12% of body weight, the heavy blanket harnesses the force of deep touch stimulation therapy. Non-toxic, food-grade poly pellets (polyethene) are contained in tiny pockets and are sewn into the fabric amid two cotton layers. This puts mass to the blanket which enables it to “embrace” the user and apply a mild but deep touch that is spread all over the body. rocabi is an adult-weighted blanket that helps you fall asleep faster, uninterrupted and induces a deep, more soothing sleep by hugging the body. It’s perfect for relaxation, meditation, nervousness & stress decline. rocabi takes maintenance acutely and its clean, interchangeable, detachable, machine-washable cover allows you to extend the durability of your blanket while keeping it brand new and clean. You can cold wash the inner blanket and outer cover. Outer cover must be washed regularly. If you’re diagnosed with panic disorder and sensory processing disorder, rocabi does the job of calming you. With restless leg syndrome, rocabi reduces the symptoms and helps sleep soundly. Deep touch sense is the sensation or calming feeling which is simulated by placing an adult weighted blanket that’s around 10% of your body weight. rocabi shows a dramatic boost in the production of serotonin since deficiency in this chemical is directly connected to sleep disorders. rocabi covers your toes to shoulders while sleeping, even for the lightest sleepers. Feel the difference with Quility Premium Adult Weighted Blanket & Removable Cover! Quility is devoted to help people maintain wellbeing with a normal, lucrative solution based on the latest technical knowledge. Apart from providing weighted blankets for special needs kids, it makes adult blankets that are larger and heavier. 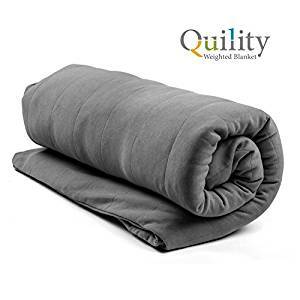 Quility Premium adult weighted blanket & removable cover offers compression therapy to help adults suffering from nervousness, stress, sleeplessness, autism, ADHD. Grey-colored Cotton/Cotton model of Quility Premium measuring 48”x78”, weighing 20lbs is ideal for the 150-200lbs individuals. It’s made of 100% cotton and filled with non-hazardous, hypo-allergenic plastic poly pellets. The minute cube stitching keeps pellets from slipping/sliding inside. Quility Premium compression blanket has a soft-to-touch removable fleece duvet cover, secured into place with 10 buttons alongside the perimeter. The heavy blanket triggers the serotonin release and the sleep hormone, melatonin. This boosts the mood and helps you to stay asleep. Just take out the duvet cover, machine wash, then air dry.100% satisfaction is guaranteed, if you’re unhappy with your purchase, get a full refund. The weighted therapy blanket utilizes Deep Pressure Therapy to fight mild to harsh symptoms of anxiety, sleeplessness, ADHD, Restless Leg Syndrome, and PTSD. The cover is very soft, the textured side and the glass beads ensure a good night’s rest. It consistently distributes weight. This therapy decreases the stress hormone cortisol, strengthens dexterity and spatial awareness and results in a slow heart rate. Get relaxed immediately with Amy Garden Weighted Blanket for Anxiety, ADHD, Autism, Insomnia or Stress! Amy Garden Weighted Blanket induces peaceful sleep to keep you stress-free and stay renewed the next day. 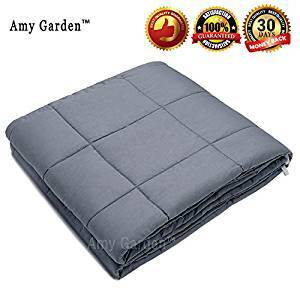 15lbs Amy Garden blanket of Grey Cotton Inner Weighted Layer color measures 48″x72″ and is made of 100% finest breathable cotton and its compartments are filled with hypo-allergenic, harmless, fragrance-free glass beads which are consistently distributed in every compartment. Suitable body weight is 140-150lbs, around 10%-15% of one’s weight. The weighted inner layer and the duvet cover are sold discretely. The weight of blanket relaxes the nervous system and releases stress, anxiety to fall asleep faster. Choose a size and weight, your body adapts to it. Use it with a duvet cover, remove the durable cover for a fast wash and dry. The inner weighted section is washable at home. By placing gentle pressure on a kid, Amy Garden releases melatonin and serotonin, allowing kids to feel safe and protected. The blanket calms down special needs people by putting mild pressure on their nervous system, creating a sensation of security like a warm hug. If you suffer from plentiful stress exacerbated by work, issues of OCD, irritability, adrenal fatigue, Amy Garden will ease your life. Get a cool cloud-like feel with Magic Weighted Blanket in Luxurious Soft Fabric! Since 1998, US-made Magic weighted blanket has over 18 years of experience offering calm and comfortable sleep. Featured in famous magazines, 42×72 – 16lb Magic blanket is in Charcoal Grey/Silver Grey Chenille color filled with glass beads with thin cover and plush feel. Sewn without noticeable stitching, Magic blanket has a soft, non-therapeutic look. Design is made by expert sewing contractors with the elegant plush chenille fabric. Magic is a well-made blanket, absolutely gorgeous chenille drapes itself comfortably over the body, contours snugly without feeling weighted down. If you’re awake by anxiety at bedtime, Magic alleviates by helping feel safe. It eases menstrual pain with the additional pressure on abdomen. Magic blanket stops night terrors, helps sleep soundly, reduces ADHD. Sleep is restful every night, you won’t move all night long. It helps with sleeping problems due to neuropathy. Weight feels good to heal ASD, anxiety, and SPD. Cure your health issues with Hypnoser Weighted Blanket 2.0 for Kids and Adults! Hypnoser weighted blanket 2.0 for kids and adults is for helping people with sleep issues and for giving that relaxation state. 48″x72″ 15lbs Inner Layer Dark Grey Hypnoser is for 100-150lbs individuals and 100% premium cotton fitting full-size beds, the cotton is healthier, softer, breathable and cool. Hypnoser weighted blanket is designed to weigh 10% of your total body to reduce stress physically while improving mood. 100% cotton lets skin breathe. Hypnoser is designed with a special technology to help with sleep management. The weight is evenly distributed, and won’t shift due to the small size. The cotton fabric is breathable. You won’t move all night, you’ll feel cozy and rested. Hypnoser promises 100% durability and guarantee as it’s made with premium-quality products. It’s machine-washable on a gentle setting, dry clean or hand-wash to keep them clean. You are refunded if you aren’t satisfied in 30 days. The stitching amid diamonds and edging is high-quality, and won’t tear or wear. Hypnoser helps persons with sensory and sleeping problems such as autism, Asperger Sysndrome, SPD, PTSD, narcolepsy, nervousness, night terrors, sleep apnea, sleeplessness, restless leg, jet lag. It works by putting pressure to body to help you relax, fall asleep quickly, restfully and for long. Feel instantly relaxed with Dr. Hart’s Weighted Blanket for Adults & Kids! Dr. Hart’s™ is a weighted blanket created by a practicing medical doctor for treating serious sleep disorders. Luxurious fabrics and pioneering design have made Dr. Hart’s™ the world’s most popular weighted blanket and the #1 recommended product by health professionals. Blanket includes removable duvet cover, weighs 20 lbs and measures 60×80. Dr. Hart’s™ uses patented GravityGrid™ stitching plan with physically-shaped patterns and DreamBeads™ for its weighted material (quartz micro-spheres). It’s an eco-friendly, ventilated, and ultra-comfy product that contours the body. It can be shared at ease by 2 people, it’s odorless, non-toxic, hypoallergenic, 60% thinner & much softer. DreamBeads™ eliminates shifting noise, providing a cool sensation in summer & cozy warmth in winter. It increases the contact surface area by 750%, maximizing pressure application. Super-soft, minky, micro-plush, detachable & machine-cleanable cover feels deluxe & adds further warmth. Inner blanket is 100% organic cotton (moderate cycle/hand wash/air dry). Designed to physically feel calm and cool by distributing soft pressure across your body, Dr. Hart’s™ excites the deep touch receptors to release serotonin and encourages repose. They’re perfect for persons seeking natural & effectual solutions to improve sleeping habits. Heavy gravity blanket allows anxiety relief. Dr. Hart’s™ is a Sensory Blanket (to cure sensory processing disorder), an Autism Blanket, a Therapy Blanket, and ADHD weighted blanket. It’s a stress relief product, fits king, queen, full and twin-size beds. Luxurious, comfy & ultra-soft, Dr. Hart’s™ reduces stress & promotes deep sleep. The gentle weight encourages pivotal pressure points to promote a feeling of safety, allowing you to reduce stress. Deep Touch Pressure lowers cortisol, the hormone for stress, & increases serotonin, which eases relaxation. You fall asleep more deeply. It’s a natural solution to alleviate stress. 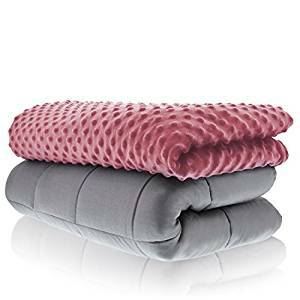 Get a super-plush feeling with Weighted Idea Weighted Blanket Comforter for Adult Woman and Man! Weighted Idea weighted blanket comforter for grown-ups delivers calming and comforting sensory advantages. Cotton Weighted Inner Layer Navy Blue 12lbs Weighted Idea without removable cover measures 48”x78” and fits perfectly queen-sized, twin-sized beds and is suitable for teens/adults to generously cover the body. It can be used for sleeping, reading, lounging, or meditating. Inner Layer is sewn into tiny pockets that fit non-hazardous, hypoallergenic, environmental, sand-size pellets consistently distributed for comfortable compression. 100% premium cotton fabric is breathable and natural. Weighted Idea can naturally unwind the nervous system and diminish stress by simulating the sensation of being hugged (Deep Touch Sense). Durable Weighted Idea provides unconditional refunding/exchanging within 30 days. Wash inner blanket by dry clean/hand wash and hang/flat dry. Weighted Idea provides strong therapy for agitation, depression, anxiety, insomnia, autism, ADHD rendered by swiftly changing times. Weighted Idea sensory blanket is engineered to raise melatonin and serotonin levels and diminish cortisol levels to perk up your mood and encourage soothing sleep by imitating profound pressure touch simulation. Enjoy icy-cool soothing effects with YnM Cooling Weighted Blanket, 100% Natural Bamboo Viscose! Thin Gravity 2.0 YnM cooling weighted blanket offers cool sleep therapy for persons with anxiety, autism, ADHD, insomnia or tension. 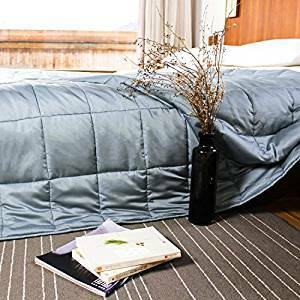 Sea Glass Inner Weighted Layer 48”x72” 15lbs (for twin bed) Thin Gravity 2.0 blanket has ultra-soft, silky-smooth, 300-thread count natural bamboo viscose with thin poly-fill and top-quality glass beads consistently distributed in tiny compartments. Outer fabric is uncontaminated bamboo with soft brocaded satin-like feel with natural antibacterial function. The power of bacterial culling on bamboo is 71% after a day. Honeycomb fabrics oust moisture and amplify breathability. It’s close-fitting to body form, self-adaptive to sleeping position, generates smaller temperature fluctuations, you sleep quicker and extend sleep time. 3D lock-bead sewing ensures softness, comfort, averting bead leakage and bunching up. There are two additional layers of long-lasting & breathable cotton fabric amid bamboo face and thin poly-fill to optimize the durability of blanket for years to come. It’s machine-washable. You can spot clean or buy a detachable duvet cover. It’s great for hot, sweaty sleepers; breathable smart fabric and moisture-absorbing management for year-long comfort enable sleepers to stay dry, cozy, and cool. Cold-to-touch bamboo material and glass beads have controlled heat capacity to keep you cool through the night. With deep touch therapy and cooling bamboo feel, you stay asleep for long. Reduce your worries with Good Knight Weighted Blankets For Autism | ADD | Stress | Anxiety! Good Knight weighted blankets are a life-saver for persons with autism, ADD, stress, anxiety and help relieve these symptoms. 15lbs washable Good Knight blankets are constructed of 100% premium cotton. Each box is filled with small, safe, hypoallergenic poly-pellets to dispense weight consistently across your entire body. Duvet cover isn’t included. XL 60”x80” blanket is the ideal size for teens/adults who are 6’6”+ tall and weigh 100-150lbs. The additional weight from Good Knight blanket calms your nervous system allowing you to improve general quality of sleep. The durable blanket evenly distributes weight and the temperature remains neutral all night. The weight relaxes you and helps you feel secure. It’s extremely calming. 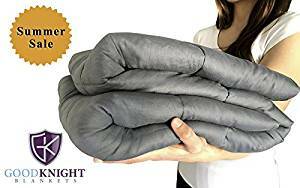 Good Knight blanket provides abundant benefits, from reducing strain to help calm restless legs, it helps with ADHD, sensory, sleep disorders, ADD and anxiety. You won’t toss/turn. If you suffer from a very debilitating anxiety that causes insomnia, you’ll feel comfortable to pile Good Knight blanket. If you slide under this thing, you fall asleep and sleep undisturbed. 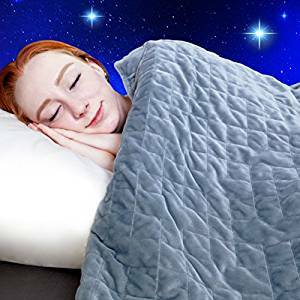 Ward off all health troubles with Weighted Blanket Adult Size-For Heavy Stress Relief, Autism, Restless Leg Syndrome and natural calm for anxiety! Sonno Zona brings you a foremost extra-soft, wellness improved, easy-care weighted blanket as a natural option to live without medication, it promotes calmness and relaxation from anxiety-ridden and disorganized lifestyle. It’s a holistic alternative for stress and sensory disorder. Navy-colored 20lbs weighted blanket measuring 60”x80” is made of relaxation sleep fabric. It has sensory-receptive “minky dots” on one side with a Cashmere-like downy texture on the opposite side. Made with hypoallergenic material and planned to permit gravity execute its wonder to diminish stress and mitigate anxiety. The cover is luxurious duvet style with safety ties inside and elastic zip close. It’s weighted by little beads woven firmly in quilted plan. It promotes stimulation of pressure points that activate your brain to create serotonin and handle physical and mood sensitivity, insomnia, ADHD. Tactile comfort is offered. It provides a mild and spongy defensive nook that simulates the ideal feeling of added weight from comforters and other lush covers with less warmth in comparison. Cover is expediently machine-cleanable and meant for tumble dry. It promotes effortless personal cleanliness to your cherished ones, durability, plus swift convenience. It reduces anxiety for active loved ones who do much laundry. The stitching is well-built. There are sewn loops to connect to the soft duvet cover and it won’t slip at all. It has glass sand inside but is breathable and isn’t loud if it moves around. 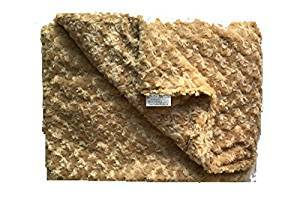 The blanket helps in sensory processing disorder (SPD), autism, anxiety, restless leg syndrome, tension, ADHD, chronic pain, sleeplessness and other conditions by deep pressure touch stimulation, or DTPS. It relaxes, promotes calmness, sleep and helps stay asleep longer. This is a non-medicated, drug-free method for reducing risk factors to numerous diseases, and in the healing of countless illnesses. If you’re a sensory person and simply enjoy the feeling of weight while sleeping, this blanket is great. Go for the organic healing by Full Bed Weighted Blanket by Lifetime Sensory Solutions, Weighted Sensory Blanket for Adults, Double Bed Weighted Blanket! Lifetime Sensory Solutions presents full bed weighted sensory blanket for adults. This double bed weighted blanket applies medium-high pressure for instant relief from health issues. Made in USA, the blanket has 25lb for medium-high pressure made of 100% cotton and is of Prime White Sateen color. Sewn with implausible detail and quality, you can use it in both summer and wintry weather due to the well-ventilated 100% cotton sateen fabric. It’s filled with harmless, hypoallergenic plastic pellets, firmly sewn into pockets consistently distributed. The makers add hypoallergenic “fluff” for additional comfort, so the blanket feels like a proper blanket and not a “beanbag”. Blankets are sized at 56″x72″ and fit the top of the bed, not sides, for security reasons. The weighted blankets offer a calming effect, promote sleep, and assist adults with different needs from restlessness, anxiety, PTSD, depression, Autism, Asperger’s, and SPD. This blanket can help users suffering from fibromyalgia and constant pain. The blanket is handcrafted in the USA with attention to detail and durability, it’s prewashed with allergen-free materials, preshrunk for precision, and made in dirt-free, hypoallergenic sewing facilities. Easy exchange/return policy is available. If you can’t find the right weight, just exchange it. You can get a full refund within 30 days of receipt. The blanket helps side/stomach sleepers, Restless Leg Syndrome. It induces deep REM sleep. The beads really keep you cool and the weight is distributed consistently, the sateen fabric makes a sweaty sleeper cool while including the weight, that makes a tranquil serene night’s sleep.